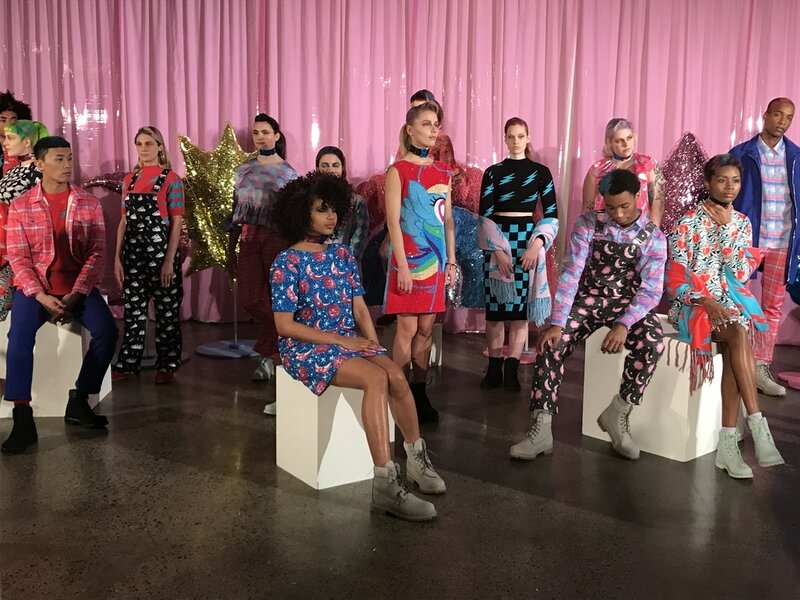 Toronto based Fashion Designer Hayley Elsaesser turned out a dynamic men+women's collection that was nostalgic for the 90's: clad in neon pinks, blues, and yellows, the Hasbro partnered collection was all about color. Models for the line were presented in a multi-level, staggered crowd, reminiscent of an urban editorial shoot. A diverse mix of models, the clothes were nicely showcased through the casual positions of the models, highlighted by a bright pink background. The collection highlighted collaborations with My Little Pony, MAC Cosmetics, and Timberland boots. Distinct identities of the collaborators were apparent in the collection, while Elsaesser was able to maintain her own identity with a kitschy compilation of pattern, print, and graphics on the retrofitted clothing. The SS17 release was launched as a cool mixer. Guests were invited to eat, drink, and photograph models styled by MAC much like mannequins. Big name hair stylist Mischa G. led the Bumble and Bumble team to style and dye models' hair to match the clothing, and exaggerated MAC makeup of the late 20th century. Timberland provided all the footwear; their classic fit boots adorned the feet of models in deep hues of red and blue. ​Though there was a finite amount to see, several celebrity guests appeared at the top of the event, namely Instagram star Luca Sabbat.